You can use this bumble bee costume accessory kit to create a bee costume for a school play, as a quick and easy Halloween costume, or for costume dress-up playtime fun with kids. Many of our directors use this kit as a base for creating their Jitterbug costumes for "The Wizard of Oz." The bumble bee costume accessory kit is colored as pictured. 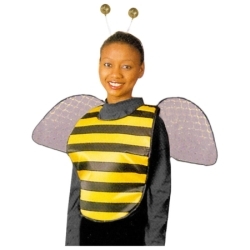 Kit includes a pair of chiffon wings, an antenna headband, and a bee print vest. One size fits most adults and children.